Have you guys heard of "Unprocessed October"?? Basically anyone and everyone in the country (or I guess world for that matter) was challenged to go beyond eating organically, grass fed, and sustainably farmed/raised... and really look deep into their favorite foods and eliminate ALL processed foods or products made with processed ingredients. For the TOTAL month of October. Crazy, right? Kind of. But a fun challenge as well. So unbeknown to my darling husband, we Mains took that challenge. I spent the last two weeks of September digging through our fridge, freezer, and pantry reading every single label, throwing away (or honestly- munching it up before October got here) processed foods, and spending countless hours online and in our local grocery store looking for healthy alternatives to some of our favorite "go-to's". I'm happy to say we didn't do too bad- only a few everyday food staples needed to be eliminated. BUT those "few" items- were big ones. Things we really did need TO SURVIVE! <-- Cue dramatic music. One thing- the bigger of the foods that had to go, was my husband's much loved breakfast cereal. Now I thought I was doing good here! We shopped at the beloved Trader Joe's and we all know they try very hard to refrain from supplying and stocking their shelves with any food or food items that have GMO's, preservatives, or unnatural ingredients. So, having always bought his cereal at that store, I thought I was totally good. Not. Upon reading what it means to really be unprocessed, I found that although the label was constructed of wholesome ingredients- it was the way in which the cereal was made that made it...well...processed. The way they get all those wheat-filled ingredients to be puffy and light involved quite a bit of processes. Process. Process. Process. How many more times can I say the word "process"!? This blog explained it quite easy. Read your labels. If you couldn't make the product yourself...if there is an ingredient you can't go to your local grocery store or health food store and buy yourself in it's natural form it's processed and needs to go. Simple right? So his cereal he eats 10 cups of every morning...sadly, had to leave us. Eliminating it wasn't the issue. It was replacing it with something he'd love just as much, if not more that was the problem. I needed to replace that easy "go to" with something just as easy. Something he didn't have to think about when groggily trying to eat and get ready before work in the A.M. So, I chose to try my hand at granola. You know what? Despite my previous thoughts- granola was simple to make, it's ingredients were easy to find (I mean...you can get almost all of them at Target even! ), AND homemade was totally yummy. You do pay a little more up front for all of the ingredients BUT the end result produces WAY more granola than your little $4 box of store bought could ever try to become. This recipe makes approximately 11 cups, which at 3/4 cup per serving equals A LOT of servings! Plus it's so good for you. Plus plus it's totally UNprocessed. Score. 2. 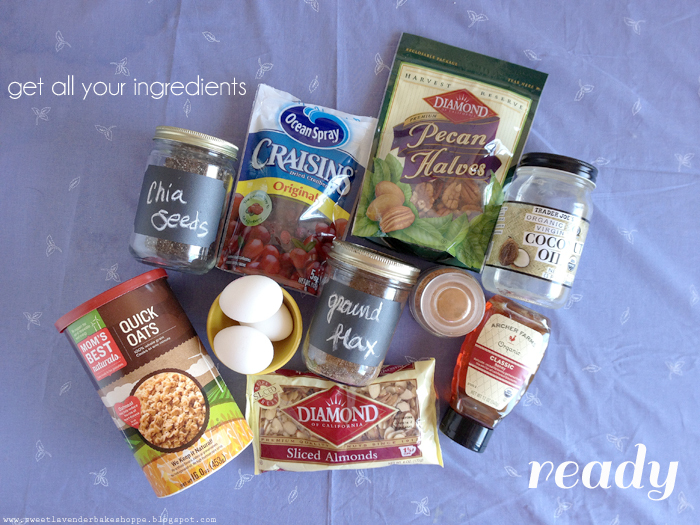 In a large bowl, mix thoroughly together your oats, almonds, pecan pieces, ground flax, chia seeds, and ground cinnamon. Set aside. 3. 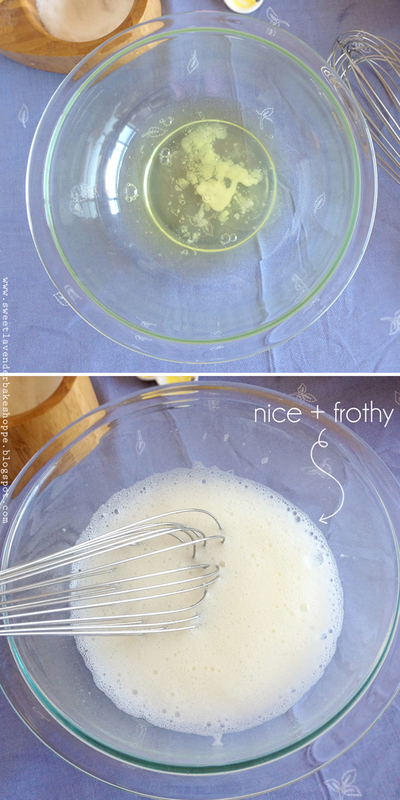 In a medium sized bowl whisk your egg whites and salt until your whites are frothy. This should take about 3-5 minutes of hand whisking. If you choose to do so in a stand mixer (or use a hand mixer) just beat until frothy, not soft peaks. 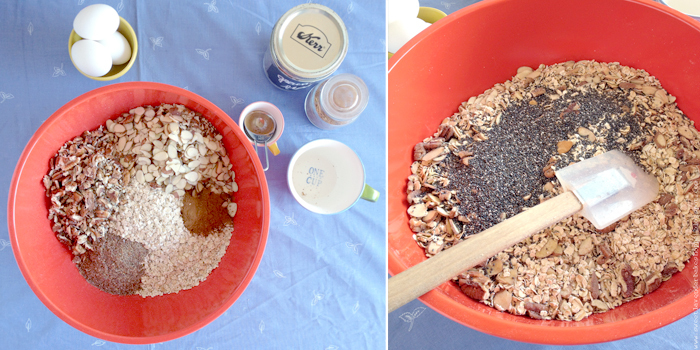 **If you are doing this recipe egg-free, just omit last step and add your salt directly to your oat mixture. 4. 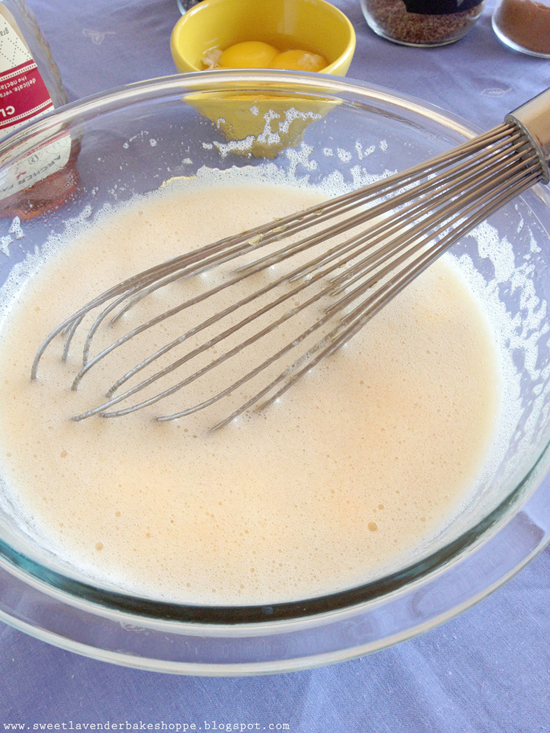 Once your egg whites are frothy, mix in your melted and cooled coconut oil and your honey. Combine well. 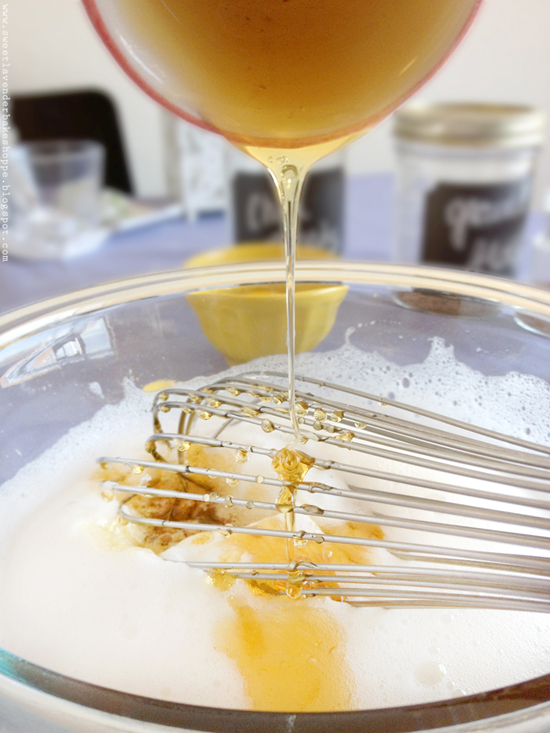 Here's a great way to measure honey so that it doesn't stick to your measuring cup! 5. 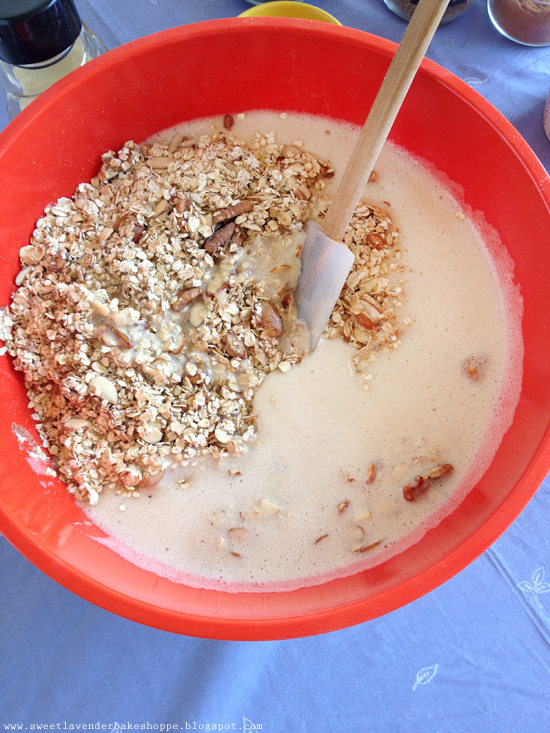 Pour your egg mixture over your oat mixture and combine completely and thoroughly. There will be a tendency for dried oats to sink to the bottom- so make sure you mix very very well. 6. Once combined, divide your granola between your two cookie pans (or more if your pans are on the smaller side) and spread out so that it's a nice 1/4-1/2" layer. No need to press down really- just make sure it's spread out nice and evenly. 7. Bake 15-20 minutes on that upper rack, turning your pan half way through baking time to insure even browning and baking. 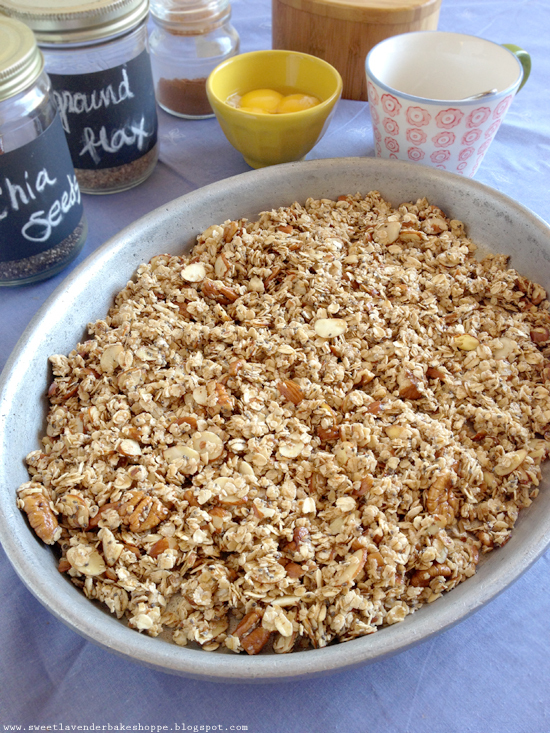 Remove pans from oven, and flip and toss granola in pan breaking up any large pieces, with a spatula. Make sure to bring the sides into the middle (they will want to brown quicker than the middle) and move the middle out. Stir and mix up well. Then spread out so it's a single layer again. 8. 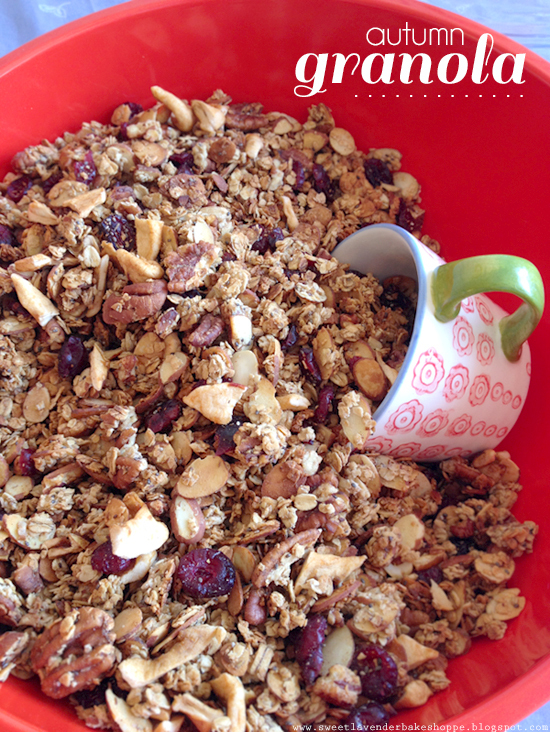 Bake another 10 minutes or until your granola is crispy and a golden brown throughout. Again, watch the sides of bottom of granola- if it's darkening too much, simply remove pan from oven, stir up again, and add back to oven. 9. Remove pans from oven and allow to cool completely. 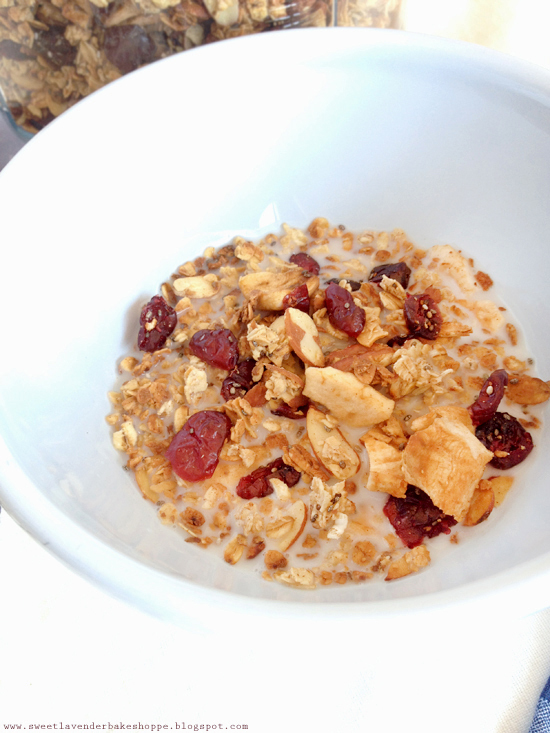 Once cooled, add granola to a large bowl and mix in your cranberries as well as your apple pieces. Then simply add to a large air tight container and munch away! ** Will store at room temperature for up to 2 weeks. Can be added to a freezer proof air tight container and frozen for up to 3 months. To thaw, just place in refrigerator overnight and then allow to come to room temp! 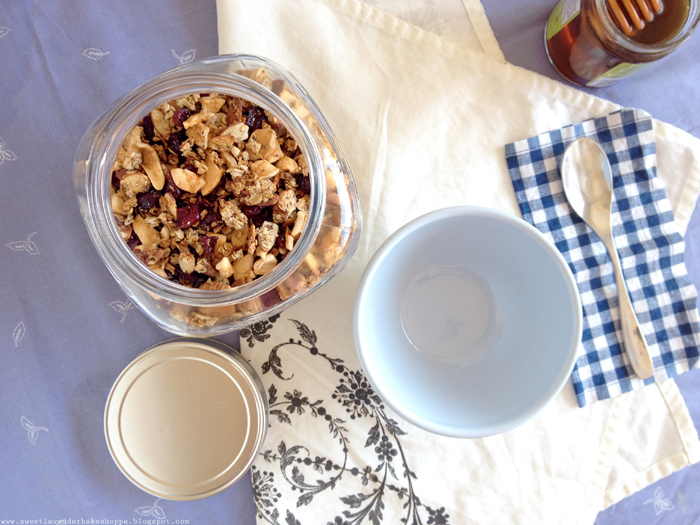 This granola is fantastic as a healthy unprocessed breakfast! Add to almond milk or regular milk or pour over greek yogurt for a protein punch! Also great sprinkled over vanilla ice cream or brought with you for an on-the-go snack! I love living unprocessed. It's amazing when you start going through labels what they are putting in our food. Right?!? AND what they can get away with! I hadn't heard of this, but my goodness we should try this in my house!! It's quite the eye opener!